This launch is in response to inputs from our wide following of dealers and vehicle owners who told us they wanted mobile apps. Yes, there’s an app for that. 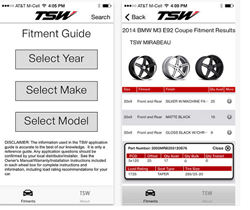 Now that TSW Alloy Wheels has introduced a mobile fitment guide for smartphones, tuners and customizers can search for custom aftermarket wheels across the company’s ten brands of precision alloy wheels. “It’s a mobile world today,” observed TSW Alloy Wheels president Terence Scheckter. “This launch is in response to inputs from our wide following of dealers and vehicle owners who told us they wanted mobile apps. We were pioneers in creating a robust application guide. Now we have taken the innovation initiative again by making all that information available on smartphones,” Scheckter added. technical details, including offset and load rating. The fitment guide also indicates whether each wheels size is intended for the front or rear axle, supporting TSW’s commitment to staggered wheels, in which the rear tire/wheel combination is slightly wider than pairings on the front axle. Staggered fitments, increasingly specified as original equipment and long preferred by aftermarket buyers, improves both linear and lateral acceleration and traction, while adding a distinctly more aggressive component to the car, truck or SUV. TSW Alloy Wheels (tsw.com) offers 32 different models of custom wheels to fit a broad cross section of vehicles. Beyond that, the company designs, engineers and manufacturers nine different marque-specific brands, as listed below, all of which are included in the consolidated mobile app. The car wheels offered by each specialized brand have been rigorously engineered and manufactured to the highest possible quality standards to provide precise compatibility with their intended vehicles. For example, all wheels rigidly adhere to recommended offsets, which determine how the wheel fits in the wheel well to ensure congruence with suspension, body and brake components. All wheels are hub-centric, or supplied with centering rings, to ensure a trouble free fitment and velvety smooth ride. And all wheels are compatible with OE lug fasteners, the factory center logo cap and tire pressure monitoring systems. 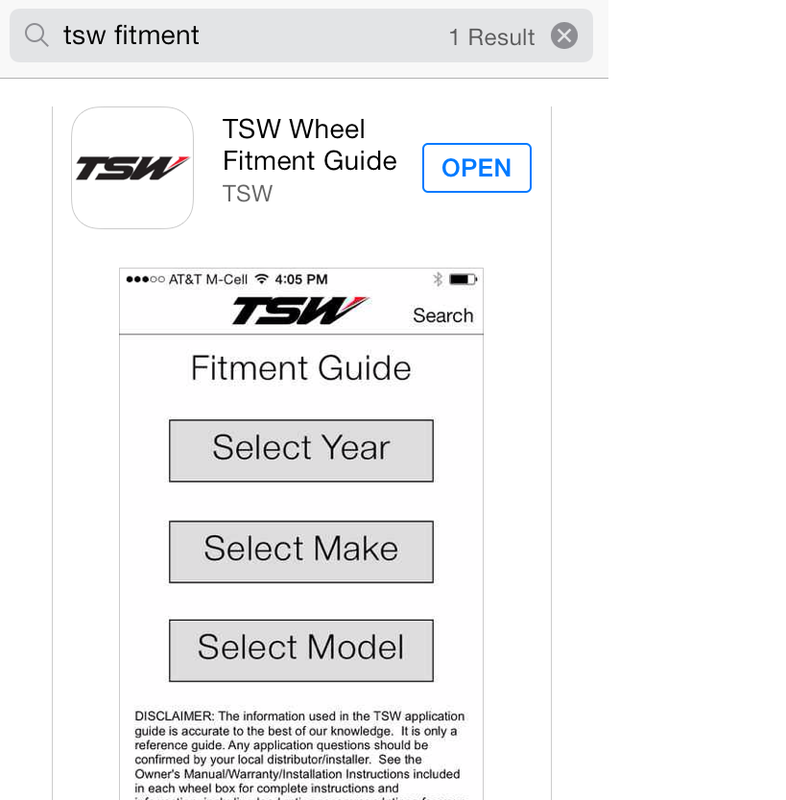 The mobile app also helps shoppers for custom wheels locate a dealer in their area. Tapping the “About” tab reveals an 800 number that can be used to locate dealers, as well as a URL to search by zip code. Headquartered in California, TSW serves dealers worldwide. The company was founded over 40 years ago by a Formula One driver and had had a continuous involvement in motor sports.